This stately plant is not a mint and is not a licorice. 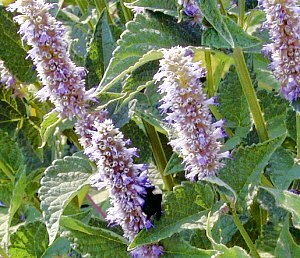 But, it is a tasty culinary herb that combines licorice flavor with mint. With a sweet rather than spicy flavor, it can be used for desserts or drinks. Try steeping washed leaves in milk prior to adding the milk to your ice cream maker. Even though the flowers of Licorice Mint are culinary it is better to leave them for the butterflies. While they can be eaten, they may contain tiny insects, thrips, that are almost impossible to remove. The bee, the bee. The big yellow and black bumblebee (at the bottom of the front spike) is one of many to visit our Licorice Mint hedge. Anise seed (often sold as candied sprinkles) comes from the licorice flavored annual plant, Pimpinella anisum. The word anise has become synonymous with intense licorice flavor and is often used to describe the flavor of many other licorice flavored plants including Agastache foeniculum. Licorice Mint flowers as far as the eye can see. 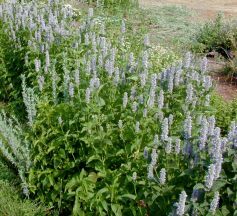 Licorice Mint (also known as Anise Hyssop) always dies back to the ground in winter and emerges again in early spring. It blooms almost all summer and will freely seed itself, if not pruned. Small birds love the seeds. It makes a great addition to our Gourmet Herb Garden Six Pack, our Zone 5-11 Fragrant Herb Garden Six Pack and our Wildlife Herb Garden Six Pack. 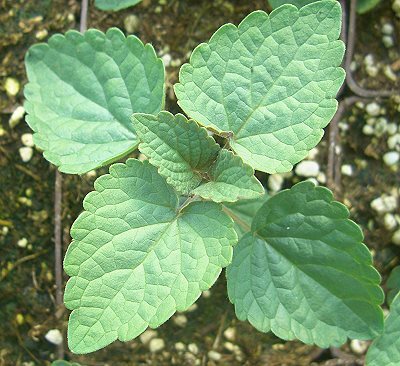 This plant is often available in plug trays. These trays hold 128 of all the same plant. They are a great low cost way to fill a lot of space. Each cell is 3/4 of inch by an inch. Check here to see if Licorice Mint Plug Trays are available.